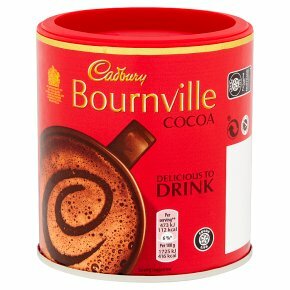 Cadbury Bournville Cocoa is made from the same high quality cocoa beans that Cadbury use to make their chocolate bars. Used for baking and for drinking, it is up to you how you enjoy! Bournville Cocoa is Fairtrade certified, helping producers get a fair deal. Suitable for vegetarians. Preparation instructions (with 200 ml semi-skimmed milk): Mix one teaspoon (4 g) of Cadbury Cocoa into a smooth paste with a little cold milk. Add hot milk whilst stirring briskly. Sweeten to taste (adding sugar will change the nutrition and increase calories consumed).